As Acton Carnival approaches, I went to interview the man who manages Acton Community Forum and who inevitably is on the receiving end of most of the flak aimed at Carnival organisers. Thames Water, who are due to start digging up the top field in Acton Park any minute now are giving ACF a multitude of headaches at the moment. They have effectively and substantially reduced the area available for Carnival this year. Since digging work has not yet started, with the Carnival just over a week away, Thames Water could easily have postponed the start of the 9-month project until after the Carnival, but small matters such as large community events don't seem to mean very much to the utilities company. There is also the small matter of the Saturday morning footballing activities which are also badly affected, but more of that later. The exterior of ACF hides behind a grille (not, apparently, against break-ins but so that children can play football without smashing windows) and the surrounding landscape isn't what you might call inviting. However, inside a selection of brightly painted walls makes the offices quite welcoming and it's bright inside. ACF moved into these offices in 2002 and were told they had a maximum of two years 'if we were lucky'. They have now been told they will be there until 2010/11 given the complexity of the redevelopment of the South Acton Estate - which is, according to Steve Flynn, "one of the largest housing regeneration projects in Europe." Steve Flynn starts telling me that although the Carnival is the major event organised by ACF, it only lasts for one day. Their other activities carry on throughout the year and "really, the Carnival isn't how Acton Community Forum should be defined." So how should it be defined? When Steve started telling me about "building community capacity", using phrases like "social capital" I thought I might fall asleep, and told him as much. However, once he started telling me about the nitty gritty of what ACF actually does every day, I woke up. 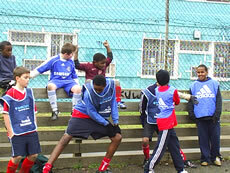 A small sample of ACF activities includes working with black minority ethnic groups and with refugee groups that support new arrivals in Acton, supporting community and voluntary activities with older people, young people and children and schools; running the Arts Forum and supporting the Black History Group. ACF’s fundraiser has brought in £1.2m over the last two and a half years to support all these groups to run their activities. Steve told me about one particular activity ACF has become involved with: "There is very successful Football going on. We have a junior side - Bollo United and a very successful South Acton Football Club which has an average age of just 19. "The trouble is, with Thames Water digging up Acton Park, the teams have nowhere to play for the new season. This is really disappointing. South Acton have reached a level where they need a proper fenced-off pitch for their fixtures. We have been desperately scouting around for somewhere to play. If anyone has some ideas of where we could re-locate the football, I would ask them to please get in touch." Bearing in mind that playing football brings together an astonishingly diverse mix of ethnic groups, it seems very short-sighted if the community can't find a temporary site for this valuable activity. Please post any thoughts on this onto the W3 Forum. Steve is particularly proud of some of the other projects ACF has been helping with: A Girls' Night at Bollo Youth Centre which is a collaboration between the YWCA and Tallo, a Somali Organisation, free Summer Holiday Playschemes on the 5 major Acton Estates to be run by residents, the Somali Summer University and weekly Youth Club and a Street Dance Club. "Street Dance was started by three young lads from the estate who were worried about the lack of provision of activities for their younger brothers and sisters. They set it up themselves and teach the children." 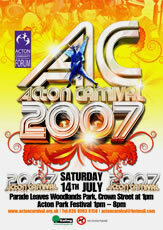 As far as the Carnival is concerned, ACF are still looking for volunteers who could help with stewarding. Steve emphasises "stewards are not expected to deal with any incidents. They are just expected to be a helpful, practical support on the day." A security firm specialising in large events has been engaged on the Council's recommendation and for the first time, some of the recycling team will be on site to help people dispose of their rubbish responsibly. The man behind much of Acton Community Forum's activities seems quietly capable of fending off any adverse comments which come his way. The ACF has a crucial role in our incredibly diverse and complicated community.